How to a duplicate or mirror a resource from one campus to another? So what's the difference between duplicating and mirroring? A duplicated resource is a resource that has been copied. After you duplicate a resource, one will become two and any changes you make to the original will not be seen in the new version. Mirrored resources on the other hand are resources that appear in multiple places but all link back to a single copy. If you make a change to a mirrored resource in any place, this change will be reflected in all instances the resource exists. If you mirror a resource across campus, and you decide later that you want to make a change, you will only need to make a change in one place. If you duplicate a resource, you are making a new copy, and if you make a change to one, it won't effect the other. Please note that when you mirror a Course, it only mirrors the resources inside the Course and not the actual Course itself. 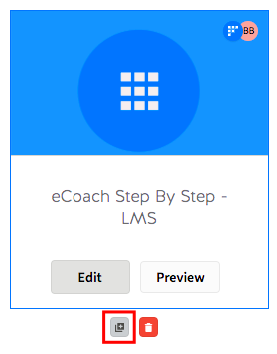 This allows you to mirror a collection of resources, but change the course name or add additional resources in the new Course. From your dashboard, place your mouse over a resource you'd like to mirror and click the little duplicate icon. A new pop-up window appears displaying a number of options broken up into 3 steps. Choose to Mirror or Duplicate the resource, do this by selecting the toggle switch. Choose where you want your resource to go. This step is the same whether you're mirroring or duplicating. 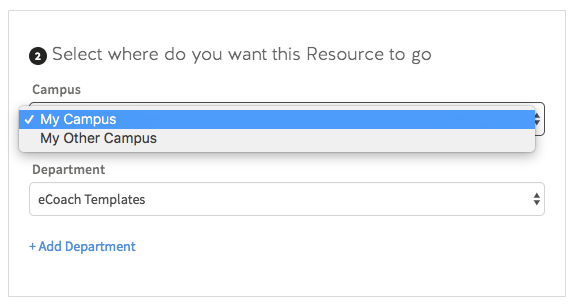 The first drop down allows you to select which Campus you'd like the resource to go. After you've selected a Campus, you must select which department you want to resource to be added to for that Campus. If you're duplicating the resource, you can give the resource a new name. By default, Coassemble automatically adds (copy) to the tile. You can remove this. If you're mirroring the resource, you can apply permissions to the mirror by denying or allow the users in the destination campus access to edit the resource. Remember, as you're mirroring the resource, any changes made in the destination Campus will be reflected in the origin Campus. By default, the 'Deny' switch is selected, if you'd like it to be editable by the destination campus, flick the switch to 'Allow'. 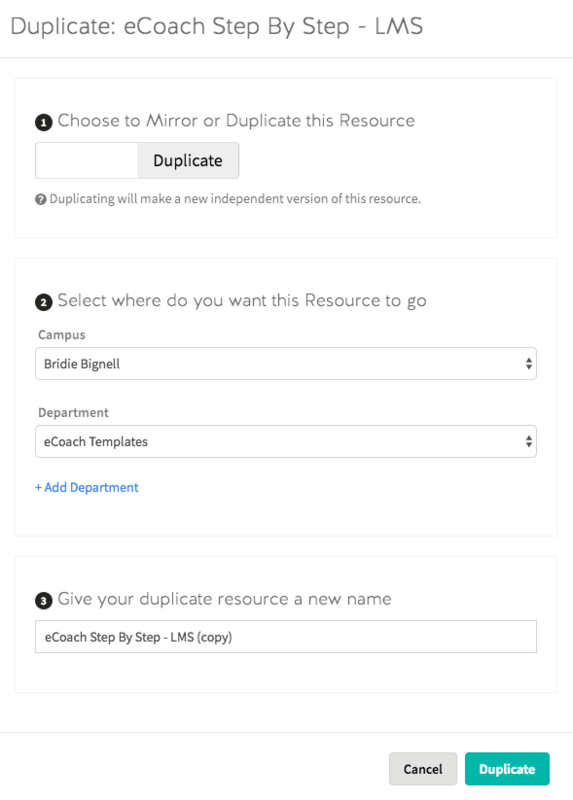 Once you're done, click mirror/duplicate button and your resource will be added to the new destination Campus.